Disgaea developer Nippon Ichi announced that the PS3-exclusive action RPG The Witch and the Hundred Knight will be released in Europe on March 21 and North America on March 25. Leave that PS3 hooked up to the television a little while longer! Released in Japan on June 25, 2013, The Witch and the Hundred Knight is now coming to North America and Europe. Publisher NIS America has announced that the action RPG will first arrive in Europe on March 21, and a few days later on March 25 it will release in North America. The title is available exclusively on PlayStation 3. Preorders are now available in the NIS America store. The standard game is listed for $49.99 USD, while the Limited Edition retails for $79.99. The Limited Edition includes a hardcover art book, original soundtrack, and a 2.5" figure of Metallia, the witch. Metallia has been renamed for the release, and was known as Metallica in the Japanese version. The title has also been tweaked from the previous title of The Witch and the Hundred Knights. Developer Nippon Ichi are well known for the Disgaea series of tactical roleplaying games. In The Witch and the Hundred Knight, you play as the Hundred Knight, one of a group of 100 knights that the witch Metallia has summoned. At times, you will be able to call on the other 99 knights to help you. 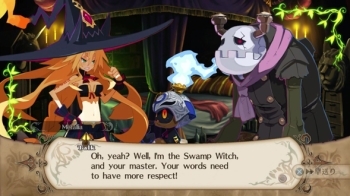 Metallia, the swamp witch, has made a pact with the Hundred Knight to help drive out her rival, the forest witch. Metallia cannot leave her swamp, and so commands you to explore the world and destroy Pillars that prevent her swamp from spreading. Shunned by the other witches and intent on spreading her toxic, noxious swamp, Metallia probably isn't as good as she pretends. The Japanese trailer for the game shows the Hundred Knight wielding oversize swords, hammers, and lances against large enemies, dodging out of the way of attacks and racking up modifiers. The Witch and the Hundred Knight is a single player game with approximately 30 hours of content, though fully completing the games' side quests will take longer.